Brainput is a research prototype system that detects when you're multitasking, and looks for other resources to help you out. Brainput is the result of work by researchers from MIT, Indiana University, and Tufts University, led by Erin Treacy Solovey. Using functional near-infrared spectroscopy (fNIRS), which is basically a portable, poor man’s version of fMRI, Brainput measures the activity of your brain. This data is analyzed, and if Brainput detects that you’re multitasking, the software kicks in and helps you out. In the case of the Brainput research paper, Solovey and her team set up a maze with two remotely controlled robots. The operator, equipped with fNIRS headgear, has to navigate both robots through the maze simultaneously, constantly switching back and forth between them. When Brainput detects that the driver is multitasking, it tells the robots to use their own sensors to help with navigation. Overall, with Brainput turned on, operator performance improved — and yet they didn’t generally notice that the robots were partially autonomous. "I used my implant to tell MILLIE what we wanted and she took care of it," Art said. "I see," Sir George's eyes focused on nothing for a moment. 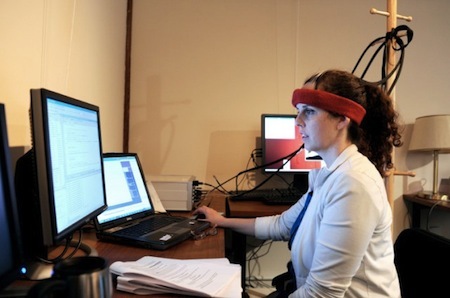 Read Brainput: Enhancing Interactive Systems with Streaming fNIRS Brain Input (pdf) and Erin Solovey's website via ExtremeTech.